Ph.D. thesis; examination for a doctorate, chemistry as main subject, theoretical physics and mathematics as subsidiary subjects; University of Fribourg (A. von Zelewski, E. Schumacher); 1971. Postdoc at the Department of Physical Chemistry at the University of Basel (Edgar Heilbronner, Rolf Gleiter); 1971 – 1972. Physical-chemical research in connection with pharmacy, Ciba-Geigy Basel, Switzerland; 1972 – 1973. 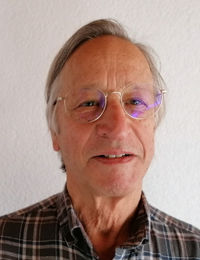 Senior assistant (Ernst Schumacher), lecturer, venia docendi (1973 – 1986), associate professor of Physical Chemistry (1987) at the Institute of Inorganic, Analytical and Physical Chemistry of the University of Berne, Switzerland. Full professor of Physical Chemistry, Department of Chemistry and Biochemistry, University of Berne, Switzerland; 1997. Research stays at the NREL (National Renewable Energy Laboratory, with Arthur Nozik) in Boulder, Colorado, USA, 1984; at Cornell University, Ithaca, New York, USA, with Roald Hoffmann, 1990 and 2000; invited Professor at the Ecole Normale Supérieure de Cachan, France, spring 2000, Mai/June 2010; visiting Professsor at the University of Münster, with Luisa De Cola, Germany, fall/winter 2007/08. Current: Emeritus professor of Physical Chemistry, University of Berne, Switzerland..
- Supramolecularly organized molecules, clusters and complexes in zeolite cavities. - Artificial antenna systems for light harvesting, transport, and trapping. - Photochemical transformation and storage of solar energy. Weissberger-Williams Lectureship Award, Eastman Kodak, USA, 2006. Member of the Swiss Commission for the use of solar energy, KNS; 1981 – 1999. Chairman of the Bernese Chemical Society; 1987 – 1989. Chairman of the Swiss Society for Photochemistry and Photophysics; 1988 – 1989.
on Photochemical Transformation and Storage of Solar Energy" (IPS); 1988 – 1996. Solar Energy, IPS-10, Interlaken, Switzerland; July 24 – 29, 1994. Chairman of the European Society for Quantum Solar Energy Conversion (QUANTSOL); 1995 –1998. project New Phenomena of Silicon Chemistry; 1995 – 2002. Member of the Editorial Board Research on Chemical Intermediates; and of other international scientific journals. Member of the Editorial Advisory Board Langmuir ACS 2012 – 2015. Associate Editor of the journal „SOLAR ENERGY“; since 1998.